I love having a cute & stylish case to hold my various handheld devices, don't you? 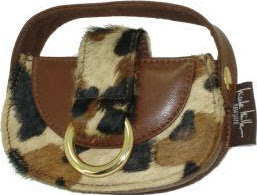 Like this adorable Nicole Miller case with a cute, furry print. Very cute & stylish. Another plus is that it fits a variety of handheld devices, be that a cell phone or an iPod. My 5G 30GB iPod fits just fine. There is one minor qualm that I have with this case, I wish the strap was a tad longer. Other than that, I feel this is a very cute, stylish, & handy way to carry your handheld devices! Get this at PrimaCases.com for $34.95.